Mysterious radio transmissions are similar to bursts detected in 2007. Radio telescopes on Earth have picked up radio burst transmissions from an unknown origin in space. 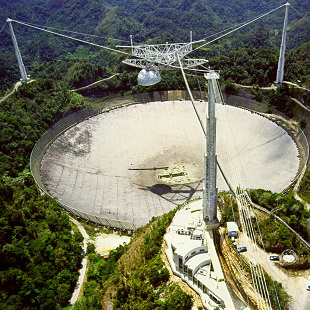 The latest transmissions were picked up by the Arecibo radio telescope in Puerto Rico (also known as Alec Trevelyan's satellite dish in GoldenEye), and additional reports on the same or similar transmissions are expected from other installations in the near future, according to NPR. The first such transmissions were picked up in 2007, by the Parkes radio telescope in Australia. Duncan Lorimer and his Parker team said the first burst they detected came from outside of our galaxy, but several bursts that followed came from much closer origins. The origin differences cast Parker's detections into doubt. That doubt evaporated when Science published a report about similar findings. Weeding out and interpreting such transmissions smacks of needles in haystacks. Not only do our radio telescopes -- as big as they are -- only see a small portion of space, but transmissions that are picked up? It's nearly impossible to calculate their origin. Like anyone else, I'd love to take such transmissions as evidence of alien life (and some astronomers are), but there are so many other causes to consider. Many, including Science, say many of bursts are from celestial origins, which could include solar flares, or black holes. But maybe...just maybe...some world out in the cosmos is trying its hardest to send out the latest megahit from its version of Beyonce. Let's all keep our fingers crossed, yes?